FILE - People protest Cameroon's President Paul Biya on Pennsylvania Avenue near the White House, Oct. 22, 2018 in Washington. In Cameroon, Security forces have been cracking down on street rallies protesting the October 7 re-election of President Paul Biya. Opposition protesters sang on Monday in front of the University of Yaounde in the capital of Cameroon. FILE - Maurice Kamto, a presidential candidate of Renaissance Movement (MRC), reacts as he holds a news conference at his headquarter in Yaounde, Cameroon, Oct. 8, 2018. 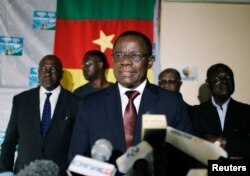 The lyrics say that opposition leader Maurice Kamto won the October 7 presidential election and that longtime President Paul Biya should hand over power. A massive deployment of police stopped the protesters from singing on the campus itself. Twenty-six-year-old teacher Boniface Onana says they will continue demonstrating against Biya’s re-election. 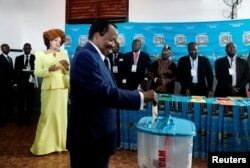 FILE - Cameroonian President Paul Biya casts his ballot while his wife Chantal Biya watches at a polling station during the presidential election in Yaounde, Cameroon, Oct. 7, 2018. 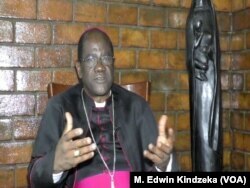 Archbishop Jean Mbarga of Yaounde at his residence in Yaounde, Cameroon, Oct. 28, 2018.